A faculty member whose research and writing regarding the components and characteristics of virality in the online media space is having that scholarship recognized with one of two best book awards at the annual meeting of the Association of Information Science and Technology (ASIS&T). Jeff Hemsley, who joined the School of Information Studies (iSchool) as an assistant professor this fall, is receiving an ASIS&T book award at the organization’s annual conference this week in Seattle. 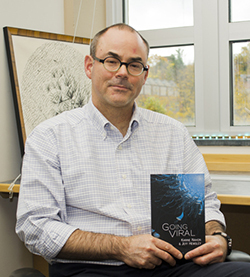 His co-author in “Going Viral,” which was published last year at this time, is Karin Nahon, associate professor at the University of Washington Information School and director of the Virality of Information (retroV) research group there. For Hemsley, the award “is exciting, because it means that the work put into the research–and that was considerable–has been recognized as significantly contributing to my academic community,” he says. The book represents two to three years of research, plus a synthesis of literature on the topic from the disciplines of network science, communication, information science, political communication and sociology, Hemsley explains. It provides a working definition of what constitutes a viral event, offers a more concrete perspective of the concept and distinguishes what virality means in the online media space, he adds. While many people think of virality as a byproduct of today’s digital networks, the phenomenon isn’t new, according to Hemsley. “Humans have been spreading information for as long as humans have been social. A lot of the same mechanisms that we talk about regarding the spread of virality probably were the same before the Internet. What’s different now is the speed. Our digital networks make the speed and the reach much greater.” Today, for example, a video that goes viral on the Internet may be one in 10,000, but those that achieve virality can be seen by as many as 40,000-50,000 people in a few hours, and perhaps a million individuals around the world in a day. “That’s what our digital social networks enable, and that’s what makes it so interesting to study,” Hemsley says. ASIS&T has been the association for information professionals leading the search for new and better theories, techniques, and technologies to improve access to information. Its membership consists of some 4,000 information specialists from such fields as computer science, linguistics, management, librarianship, engineering, law, medicine, chemistry, and education who share interests in improving the ways society stores, retrieves, analyzes, manages, archives, and disseminates information. The national award recognizes the outstanding books in information science published during the preceding calendar year. Criteria for judging includes social or practical importance of key questions and to what extent the book affects the behavior or thinking of information professionals; relevance to information science; validity of claims measured against rigorous standards of scientific inquiry; originality of ideas or methods; significance of research shedding a light on issues of concern to the field; and readability.